This last weekend I had the opportunity to attend a weathering and pigments class presented by MisterJustin of secret weapon minis. 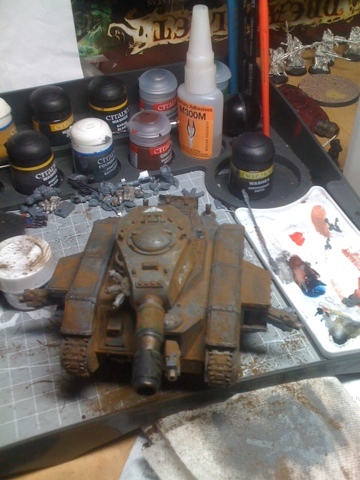 The class lasted about 3.5 hours and the result is that I have become a convert to pigment weathering. I know it's a bit blurry but I think that it turned out pretty good. Especially when you consider that it's one layer of paint over a white undercoat with pigments doing the rest! On to the armor then! 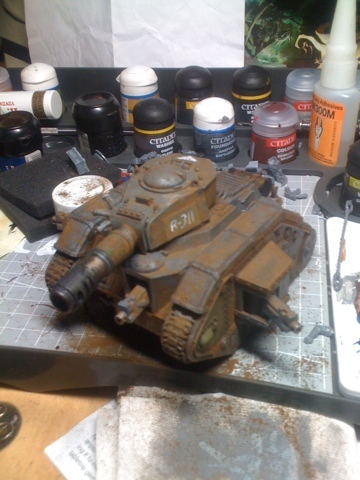 I am finishing up the weather effects on my first leman Russ battle tank! Should be done tonight. I started with adeptus battle grey and gnorloc green with a heavy wash of secret weapon armor wash over it. 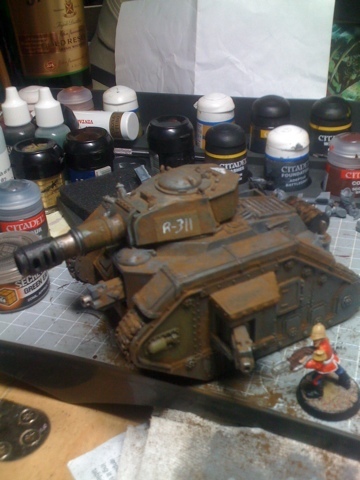 I then dry brushed Gretchen green and codex grey over the top and painted the recesses with Devlan mud. I picked out the eagle and the company marking with skull white and then started in on secret weapon green earth pigment. 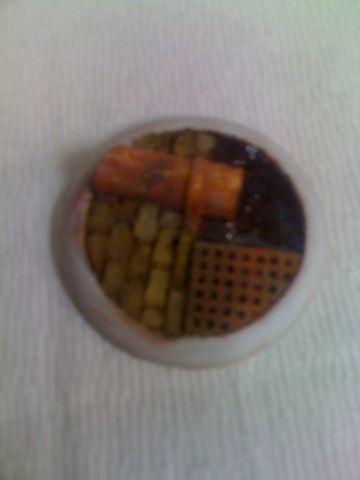 The effect is a dirt encrusted tank that has seen service on a forested world where it rains quite frequently! I've not used pigments before but I'm seriously considering it. It looks brilliant well done! I really like how it turned out and the pigments were a blast to use. check out the Secret weapon minis page, they have a couple tutorials on this sort of thing. I think I'm going to try their realistic mud effect for my fen guard bases. Welcome to the fold. Now that you've found pigments, your painting will never be the same.